Simple and introductory lab to investigate radiation. This analog ratemeter system is powered by rechargeable batteries and may be use either as a portable surveyor or as a lab station. 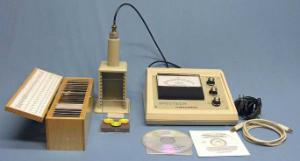 Equipped with a detachable GM probe, stand absorber set, source set, manuals, software and computer interface, the system may be used as a stand-alone station or with the computer. The emulation software transfers data from the instrument and allows the system to be used as a simple scaler/timer for more accurate measurements. The ratemeter and scaler functions are displayed on the monitor making the system ideal for classroom and group demonstrations. Files are saved in spreadsheet compatible format for graphing manipulation and printing. 470220-440 is the same but Cobalt has an activity of 0.5 μCi. Ordering information: Set includes ratemeter with STX system software; GM 35 probe with stand and cable; USB cable for PC; RSS3 Set of three sources, Alpha, Beta, Gamma; Set of 20 calibrated absorbers; and Student Lab Manual and Instructor's Manual on CD.